This asteroid model was produced using the official JPL endorsed model of the asteroid Toutatis. Its original model was obtained directly from the asteroid scientist Dr. Steve Ostro, JPL, with permission. We produced them un-painted and painted, in gold and also realistic earth tone colors. 4179 Toutatis is an elongated, stony asteroid and slow rotator, classified as near-Earth object and potentially hazardous asteroid of the Apollo and Alinda group, approximately 2.45 kilometers in diameter. Discovered by French astronomer Christian Pollas at Caussols in 1989, the asteroid was named after Toutatis from Celtic mythology. The spectral properties suggest that this is an S-type, or stony asteroid, consisting primarily of silicates. It is hypothesized that Toutatis formed from two originally separate bodies which coalesced at some point, with the resultant asteroid being compared to a "rubble pile". 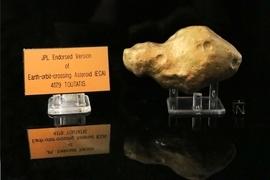 Given that Toutatis makes many close approaches to Earth, such as in 1992, 1996, 2000, 2004, 2008, and 2012, it is listed as a potentially hazardous object. We have this first offering in hand-painted gold. Size of the model: 4 1/2" L X 2" W X 1 5/8" D, Professionally painted. Tag and a stand for the asteroid included (stand for tag is not included). Cube not included. Makes a very unique, one-of-a-kind great desk or curio cabinet display!